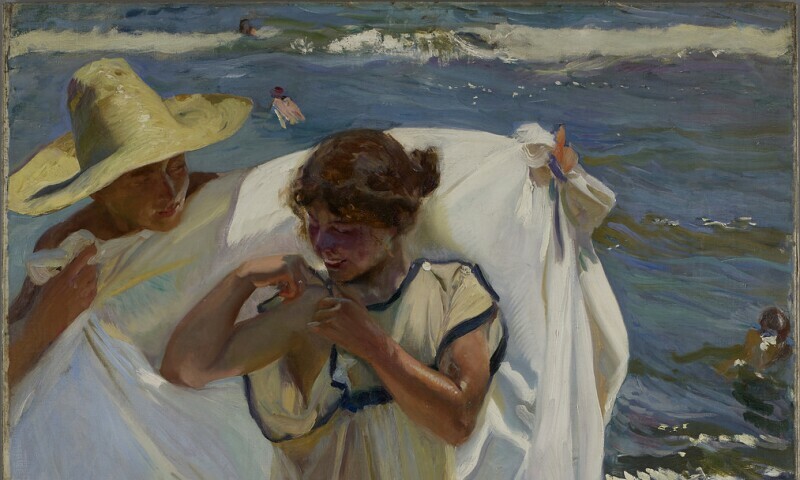 Joaquín de Sorolla y Bastida, After the bath, 1908. Oil on canvas 176 x 111.5 cm. The exhibition "Visions of the Hispanic World: Treasures from the Hispanic Society Museum & Library" includes over 200 of the most exceptional works spanning over 3,000 years from the collections of the Hispanic Society of America in New York City. A significant number of these works have not been exhibited outside of the Hispanic Society, and some have never before been exhibited. The exhibition opened at Museo Nacional del Prado in Madrid, Spain. Curated by Mitchell A. Codding, Executive Director at the Hispanic Society. "Visions of the Hispanic World" highlight works from Spain and Latin America drawn from the Hispanic Society’s renowned Museum and Library collections, including archaeological works from the Iberian Peninsula; arts of Islamic Spain; paintings, sculpture, decorative arts, and manuscripts from Medieval, Golden Age, and 18th-century Spain; Latin American colonial and 19th-century paintings, sculpture, decorative arts, and manuscripts; and Spanish paintings of the 19th and early 20th centuries.